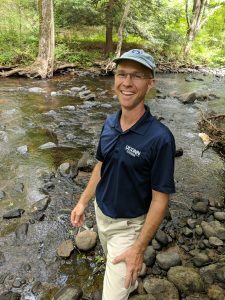 The Connecticut Institute of Water Resources (CTIWR) announced Dr. Michael Dietz as the new Program Director. He succeeds Dr. Glenn Warner, who is a faculty emeritus for the Department of Natural Resources and the Environment (NRE). The CTIWR program, based at the University of Connecticut, responds to topical water-related issues that Connecticut is faced with. The institute is tasked with facilitating applied and basic research in response to annual priorities established by these support bodies. The research program also supports the training of future water resource professionals by providing financial support to graduate students. CTIWR’s mission is to resolve state and regional water related problems and provide a strong connection between water resource managers and the academic community. An advisory board with members from regulatory agencies, academia, and non-profits in the State provides direction and guidance. Dr. Michael Dietz is an Associate Extension Educator in the UConn Department of Extension with a joint appointment in NRE. Dr. Dietz is a proud UConn alum and obtained his bachelor’s in Psychology and his Master’s and Doctorate in NRE with a focus on water resources. His current research interests are associated with the performance of green stormwater infrastructure practices and impacts of road salt on surface and groundwater systems. His most recent publication was Permeable Asphalt: A New Tool to Reduce Road Salt Contamination of Groundwater in Urban Areas. Dr. Dietz co- published this research study with Dr. Gary Robbins, UConn NRE Professor, with the objective to evaluate the effects of permeable pavement on degraded urban groundwater. Dr. Dietz will be working alongside Associate Director James Hurd, who is a Research Associate for the Department of NRE, in the CTIWR. Congratulations to Dr. Dietz on this professional achievement! Follow @CTIWR on Twitter and check out the new website at http://ctiwr.uconn.edu !